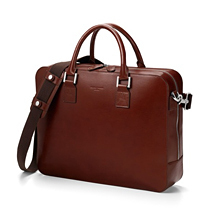 Aspinal of London's Leather Laptop Briefcases update the most essential business accessory for contemporary living. Durability is woven throughout the selection, from sturdy straps to strong handles and premium Italian-made hardware. Whether you opt for the traditional styling of the Executive Laptop Briefcase or the modern structure of the Mount Street, each style is handmade from only the finest calf leather and crafted to provide abundant space for your laptop, further devices and paperwork. This superb collection of leather laptop and business briefcases offer practical business cases in a variety of styles to suit both traditional and contemporary tastes. 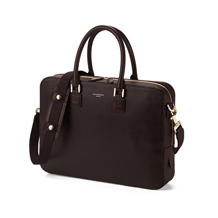 Designed with the overnight business traveller in mind, our Harrison Overnight Business Bag is a versatile multi-functional business bag guaranteed to take you from the boardroom and onward to the hotel in organised style. Redesigned to carry an integral battery charger pack for use with all your tech devices, our Mount Street Bag is the ultimate business accessory available in two sizes. For the more traditional business person, our Executive Laptop Briefcase is a classic choice and perfect for carrying documents and a 15" laptop. 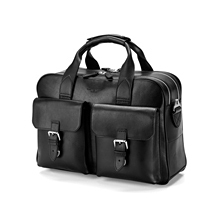 Each leather briefcase and leather laptop bag is handmade using the finest vegetable tanned Italian calf leather and finished with fine Italian signature hardware and all will arrive in an Aspinal protective felt bag.